What Do I Need To Do About Auto-Enrolment? By the end of 2017, shops and other small business employing less than 50 people must sign all their employees up to a company pension scheme – a process known as “auto-enrolment”. If you haven’t already got a company pension scheme, here’s a guide to everything you need to know about auto-enrolment. 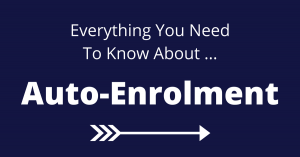 Read moreWhat Do I Need To Do About Auto-Enrolment?